As spring returns in Vancouver, people are scurrying to capture their next profile picture next to the beautiful pink and white cherry blossoms that is taking over the city. But Cherry Blossom season in Vancouver is a treat for not only your eyes, but also your belly. Like previous years, various restaurants are crafting limited-time menus celebrating this blooming of the beautiful pink and white cherry blossoms. Here are some places in Vancouver where you can catch a taste of sakura-inspired menus, from sushi to desserts to drinks. Popular Japanese downtown Yaletown restaurant, Minami, is offering a limited-time Sakura Season menu, created by their talented sushi and pastry chef team. Its contemperary menu is derived from local and international influences, especially Japan. 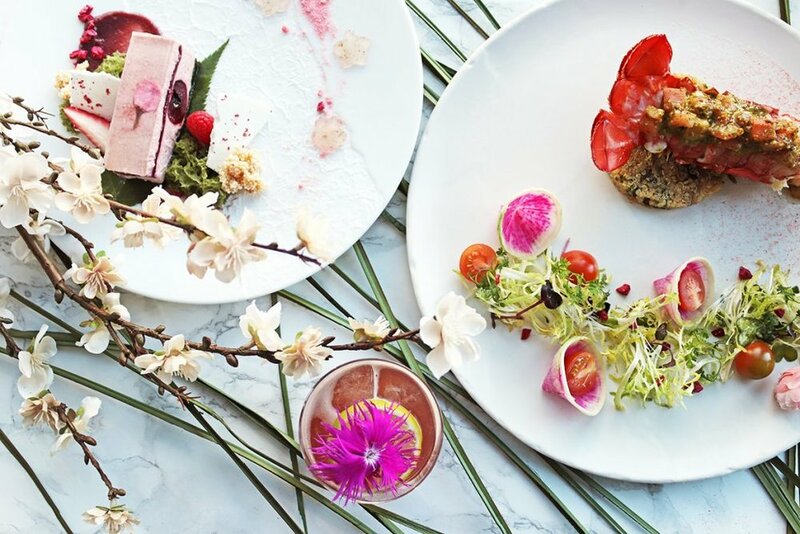 The cherry blossom season is a tradition shared by both Vancouver and Japan, which makes their new Sakura themed menu a perfect marriage of cultures. For dinner, they’ve been inspired by the beauty of spring to bring its diners a vibrant Sakura Lobster Roll by mixing pink sakura denbu into sushi rice and layering the top with shiso leaves and edible flowers. The Sakura Mont Blanc dessert, created by the talented Makiko, reflects Japanese springtime with its strawberry flavours and beautiful details. Bartender Barnaby Malong has also mixed up a seasonal cocktail for the occasion: the Saku, with a sakura salt rim, benedictine b&b, tantakatan shochu, cave du lungy, elderflower, and lemon. Minami is the destination to go for an evening full of exciting food. To deepen the springtime experience, take the short walk to Helmcken Park or Yaletown park to observe some of the natural beauty cropping up around this time. You can view their full menu here. When ripped apart, Baker and Table cafe’s famous Japanese-style melonpans ooze with mochi. Just thinking about it is enough to make one’s mouth begin to water. Melonpans are soft, sweet buns topped with a layer of sweet, crisp dough and can be filled with creams, custards, and mochi. The combination of crisp sugary dough, soft bun bread, and chewy mochi is a medley of perfection, and almost nothing can make it more exciting - except for the news that there’s a new flavour in town! This spring, the Fraser Street bakery is blessing us with a limited-edition melonpan -the SAKURA MOCHI Matcha Red Bean Melonpan 5.0 (Spring Limited Edition). It has an adorable cherry blossom branch design complete with blooming flowers baked into the top, a different design from their Sakura release last year. Baker and Table Cafe is the spot to hit for an affordable yet absolutely mouthwatering way to commemorate the new spring season. If you’re looking for something more substantial, don’t forget to try their vegetarian curry, a sandwich, or another five delicious buns. We don’t judge. Everything made fresh, from scratch, no exceptions - that’s the Lucky’s Doughnuts way. This sub-brand of the popular 49th Parallel Coffee Roasters is back with their pink boxes and special sakura cherry doughnut this year. But this time…it’s a bit more exclusive. With only 12 of them made daily, the Bismarcks are filled with Lucky’s white chocolate and matcha pastry cream, covered with strawberry and sakura glaze, and finished with edible flowers made from fondant and dehydrated salt-packed sakura. Each doughnut comes with a special custom-made pink box that you’ve probably wanted to get your hands on from last year! With only twelve at each location…you better be there early if you want to get your hands on one. Like Minami, Miku is another sushi restaurant offering three distinct menu items for the Spring season. Miku, which is situated on the Vancouver Waterfront next to Canada Place, is famed for its Aburi (flame-seared) sushi. Miku treats sushi as an art, and makes no exception when it comes to their limited-edition menu, which they have announced for the cherry blossom season. Their delectable creations includes a decadent chilled Atlantic Lobster Tail with Sakura Herb Salsa, served with vibrant greens and drizzled with a white balsamic vinaigrette. For dessert, treat yourself to a Sakura Mascarpone Cherry Cream, which has bright pops of pink and green and showcases pistachio and cherry flavours. Finally, bartender Elson Cheng has crafted their feature Yozakura cocktail to celebrate the new season. The light and refreshing pisco and cherry drink is topped with an edible flower that reflects the nature of spring. Miku is a picturesque spot to celebrate the entrance into the cherry blossom season, and definitely a place to go if you’re looking for a truly special meal to welcome the season. Nana’s Green Tea, a matcha-centric Japanese modern tea house renowned for their parfaits, lattes, and cake rolls is rolling out a new Sakura parfait for the new season! This Japanese chain originated in Tokyo. It’s Vancouver shop, located on Kerrisdale, opened its doors just last June and has gathered a following from those who love Japanese-style treats, especially their matcha, which is sourced from Kyoto, Japan. However, for sakura season, they’re deviating from their matcha roots to bring a sweet taste of spring to its customers. This parfait is stacked with layers of Sakura Mousse, strawberries, cornflakes, shiratama (glutinous rice balls) and topped off with a whirl of whipped cream. Nana’s Green Tea is the place to go if you’re searching for a sweet treat to start your spring. Their comfortable cafe-style interior is a wonderful place to relax. Afterwards, consider taking a short stroll to Kerrisdale Centennial Park to take in some of the flora blooming this season! This delectable parfait is available for a limited time only, so make sure to get yours soon! Tucked away in the heart of Vancouver’s Kitsilano area, the quiet and refined Yuwa Japanese Cuisine has become spot for quality traditional Japanese kaiseki amongst locals. From April 4 to 28, Chef Masahiro Omori and the Yuwa team will be featuring a wide arrray of Sakura-themed dishes to celebrate the Cherry Blossom Festival. The inspired dishes include a light and refreshing starter Mozuku Seaweed and Firefly Squid Sunomono and the Sakura-dai Oshisushi, a stunning pink sushi made from sakura denbu rice, kelp cured snapper, cherry leaves, and ikura salmon roes. Take a peek at their Instagram for all four sakura-themed dishes they’ll be offering this month. Sakura Night is the reception fundraiser for the Vancouver Cherry Blossom Festival, where all proceeds go towards the non-profit and charitable Vancouver Cherry Blossom Festival (VCBF). The event is an evening that celebrates Asian and asian-fusion cuisine. Chefs from all over Vancouver will be lending their culinary skills to the event. The chef lineup includes: Chef Taka Omi (Benkei Ramen), Chef Will Lew (Notch8), Chef Jason Labahn (Parq Vancouver), Chef Ken Nakano (Shangri-La Hotel Vancouver), Chef Hiro (Super Hiro’s), Chef Nobu Ochi (Zen Japanese Restaurant), Pastry Chef Kenta Takahashi (Boulevard Vancouver Kitchen & Bar), and James Coleridge (Uno Gelato). Tickets: Regular tickets: $175 purchase by April 30 midnight. Once spring comes around and the sakura trees start to blossom, you bet Dosanko will be bringing back their much loved sakura themed items. Owners Nathan and Aki has once again gone through the effort to combine the beauty of cherry blossoms with their Yōshoku-style of cooking. The result? A Sakura Onigiri, made from butter poached lobster picked beets, shiso, and tamanishiki rice, that is completely worth making a trip to Railtown just for it. And if you’re looking for something to go with your meal, the satisfying Sakura Rose Daiquiri hits the spot. Both items will be available until the cherry blossoms are “gone”. Sophia is a Noms Mag contributor whose passion and hunger for the developing Vancouver culinary scene fuels her writing. Outside following food, her interests include cooking and the fine arts. If you want to be on the winning side of your food excursions, make sure you follow these Vancouver Restaurant Bloggers to get the detailed scoop of all the unassuming and fancy schmancy spots around the city.